Congratulations to Donna W - Your booth looks fantastic. Thanks for showing us a picture of it. Love the Argyle Sock pattern. You're the winner of last week's KT blog giveaway, the new KT Diamond Templates. 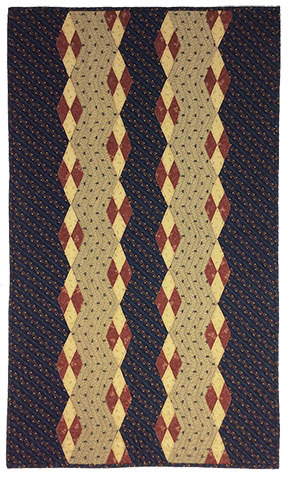 You'll be well on your way to your own Argyle Sox quilt! 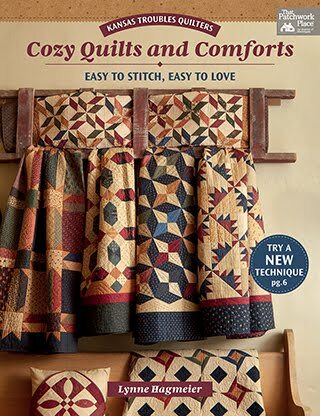 Oak Haven fabric and patterns available in September. Keep reading for more ideas on how to use your diamonds! Here at KTQ, Spring Market is barely over and we're anxiously awaiting the arrival of Christmas. 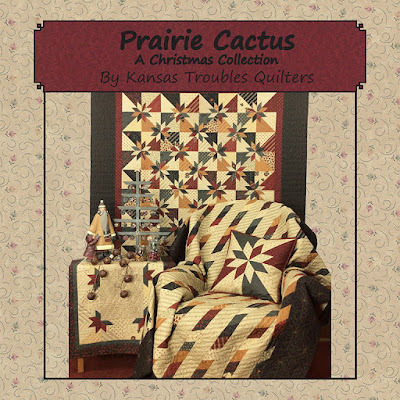 KT's newest Christmas collection, Prairie Cactus, that is. I found a couple of great prints that I combined to create a lovely feature fabric for the holidays and beyond. Not too Christmas-y, yet perfect prints and colors for adding holiday charm to your home. 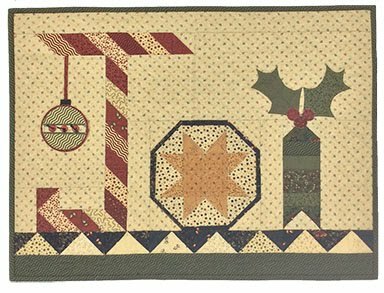 First up, the Christmas Cactus charm quilt (38"sq). 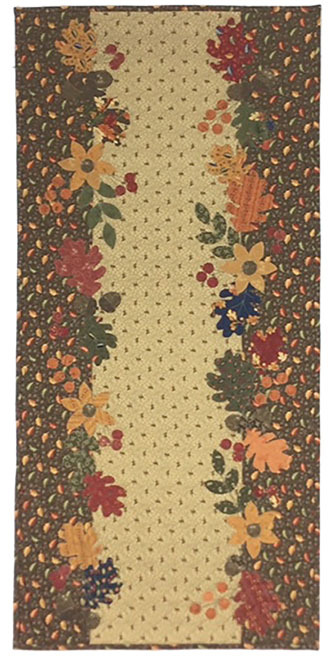 I usually limit myself to just one charm pack and a couple fabrics for my charm quilts, but this design added up to 2 charm packs plus 3 additional fabrics. 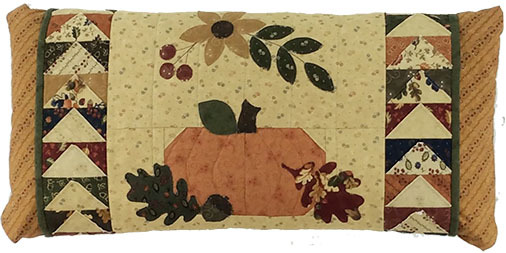 Still a great value for a seasonal quilt. The background is pieced with layered patchwork triangles creating the red zigzag border. The cactus flowers are fused raw edge applique diamonds. 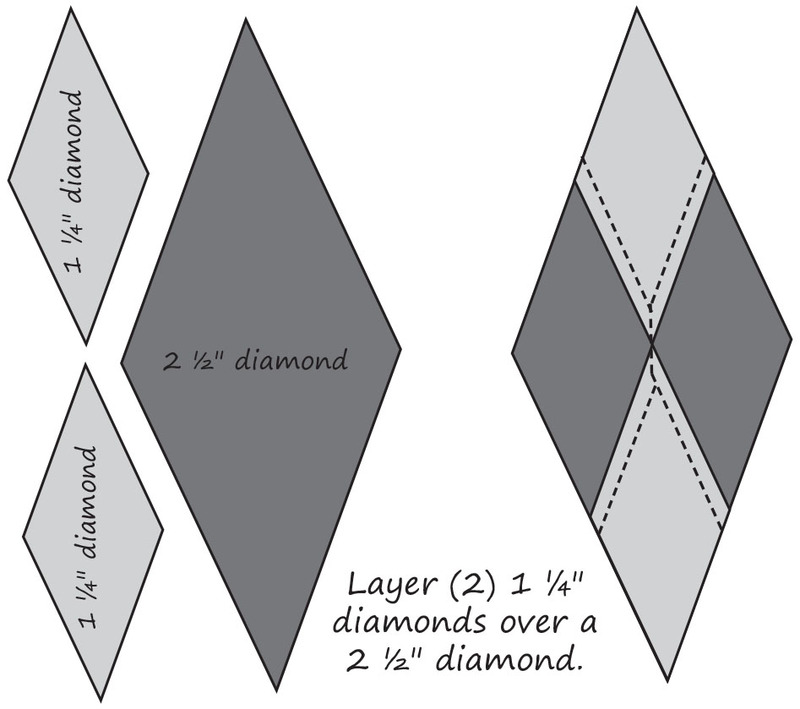 How did we make the perfect diamond shapes? Thanks for asking! 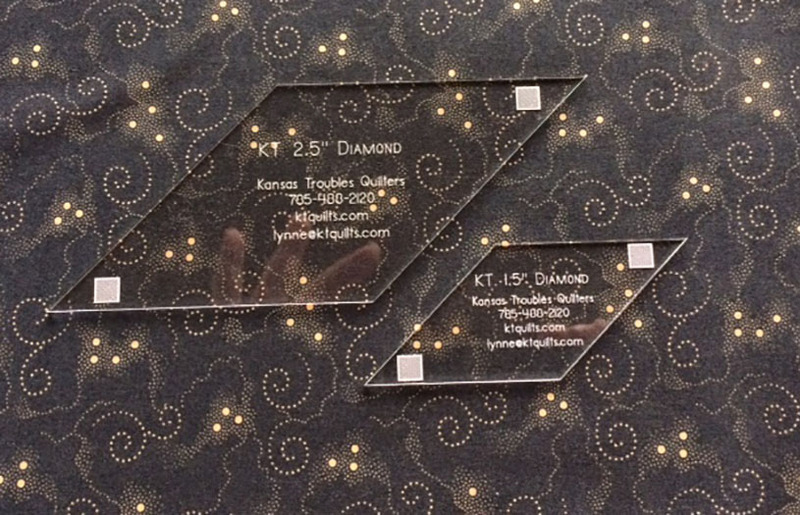 We now have KT Diamond Templates - a 2-pack of templates with a 2 1/2" and a 1 1/2" diamond shape. They're sized to fit a Jelly Roll and Honey Bun, respectively, or can be cut from yardage/scraps. For some projects, I've backed them with fusible web. 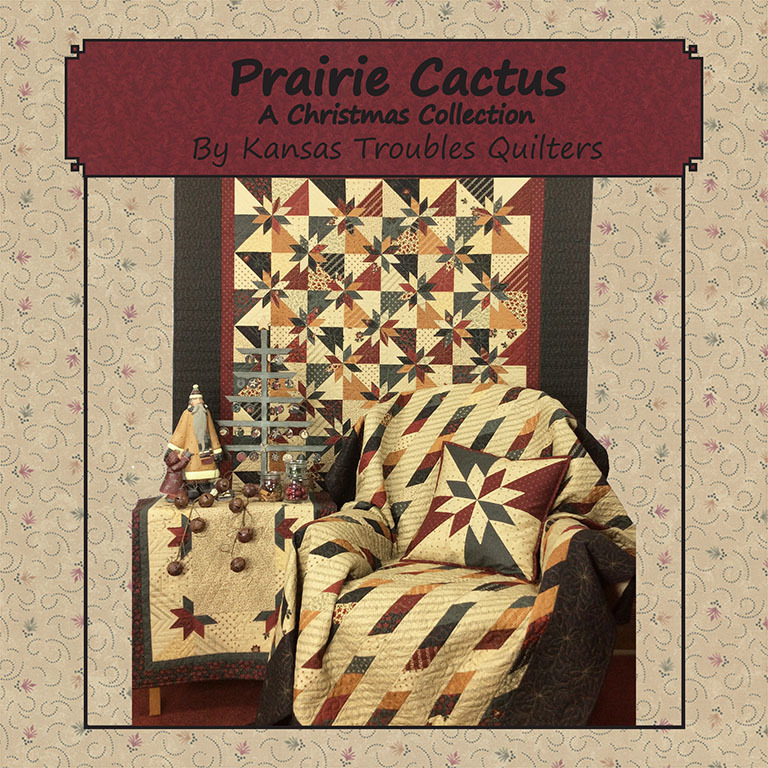 Our Prairie Cactus book with 5 projects is available now (retail $15.95). 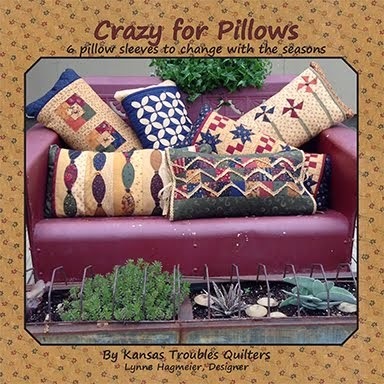 It includes 3 lap quilts, a runner and a pillow. 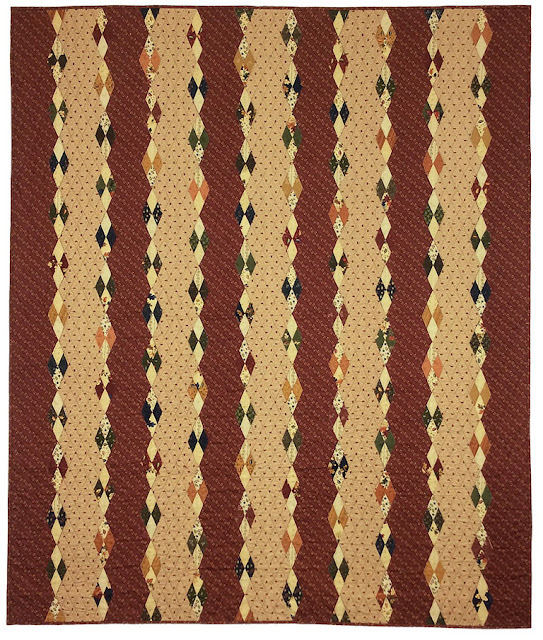 The Prairie Cactus fabric collection with 31 pieces in reds, greens, golds, blacks and tans will arrive in June. 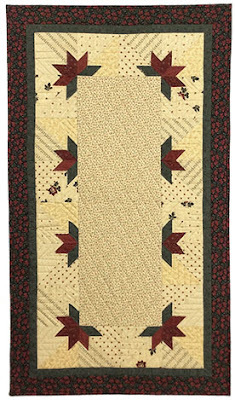 With a Layer Cake and Jelly Roll, you can whip up this large lap quilt that sparkles with cactus stars and flowers. Big blocks featuring the 2 1/2" diamonds layered/stitched on top of triangles make it go together quickly. With a few leftover reds & greens and the small diamond template, you can make the perfect background for your holiday centerpiece. Old jars filled with red & green candles glowed thru the center of my runner for Christmas last year. Watch for more Prairie Christmas projects next week. Comment here to win a Prairie Cactus charm pack. 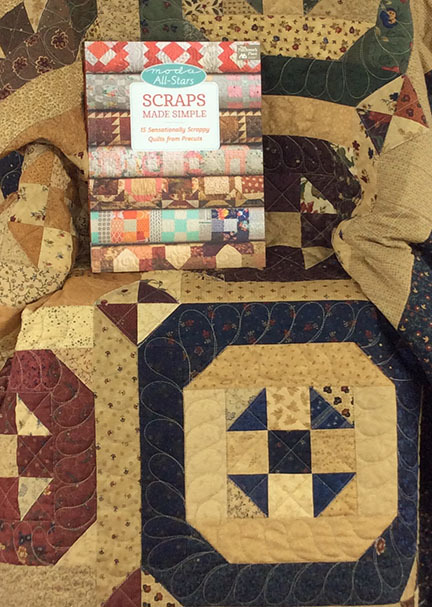 During the month of June, we'll be sharing scrap bags and boxes leftover from all the Prairie Cactus projects plus the new book, charm pattern and more! Don't ya just love Christmas in June?! 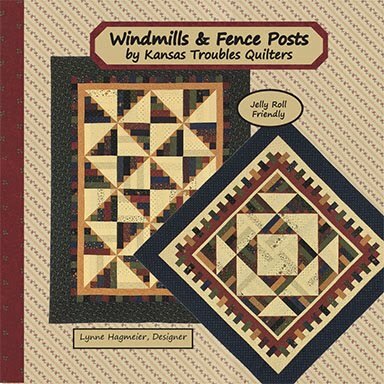 Jenny Reed - Love what I can see of the Cutting Corners quilt; and I want to make the pumpkin table runner and the pillow sleeve(s)! So many projects, so little time!! 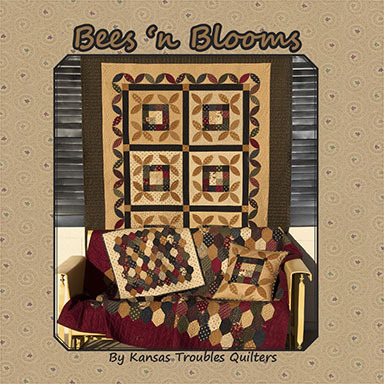 and the second winner will receive a KT Oak Haven charm pack to start one of the runner or pillow projects shown last week. 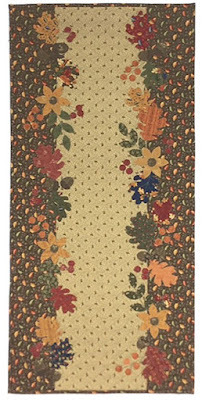 Allison - I love your Oak Haven Table Runner! We live in the woods of eastern Pennsylvania and there are at least 5 different types of oaks I've identified on our property. Off all the trees we have, the oaks are my favorites. Congratulations to both of you. Thanks to everyone who commented. I work by myself with little feedback except from my husband and staff. They're all wonderfully supportive and excited about new projects, but it's always fun to hear from "real" quilters. I look forward to reading your thoughts each week. 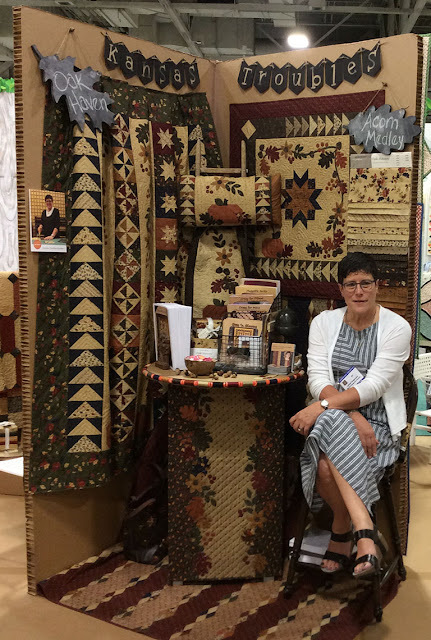 We drove to Salt Lake City, UT last week to hang out with all the Moda crew for a totally inspiring and energizing weekend of quilting fun. The theme for market was Camp Moda with merit badges given out to the shop owners at each designer's booth. My badge says "Got fabric?" Kind of a rhetorical question for any quilter, isn't it? But so true! The designer row was set up a little differently this year, more of a little village with each of us "living" in a corner surrounded by our neighbors. So much fun! Here's the KT booth full of Oak Haven quilts, fabric and my Aurifil thread table. See the spools surrounding the table top? 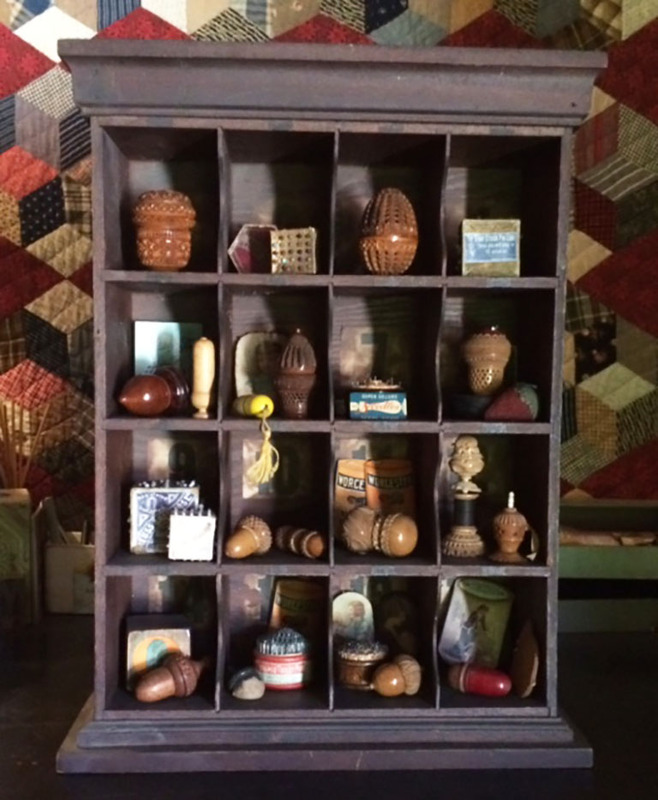 Robert wants to keep it for a display at the store! Of course, R shot the picture while I was visiting with my Moda designer neighbors, Polly Minick and Laurie Simpson of Minick & Simpson, so my mouth is always blurred. Thanks, dear. 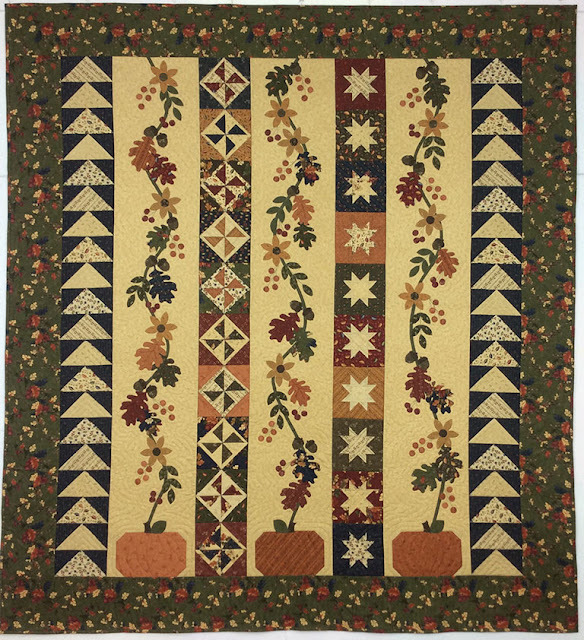 Acorn Medley is the charm quilt for my Oak Haven collection, using a charm pack and just 3 additional fabrics. Lots of fall color and appeal in a little package. I love the pop of navy along with the warm fall tones. It blends beautifully with the the golds, pumpkins and reds. I know, you're asking yourself, "Really, there's more?" Yup. 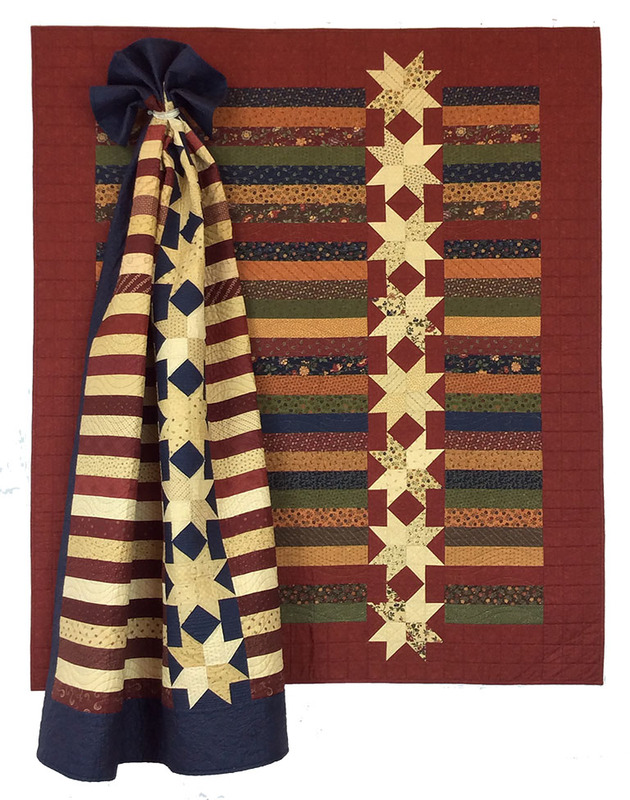 In addition to the Oak Haven pieced/applique lap quilt, two runners and pillow sleeve, I had to share this simple strippy quilt featuring our new KT Diamond templates. I designed them to fit on 2 1/2" Jelly Roll strips and 1 1/2" Honey Bun strips for easy cutting. 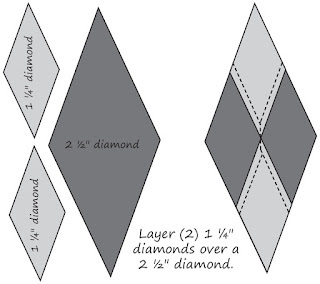 When using precuts, two sides of each diamond have precut pinked edges and two sides have bias edges. It works perfectly for my layered patchwork technique. 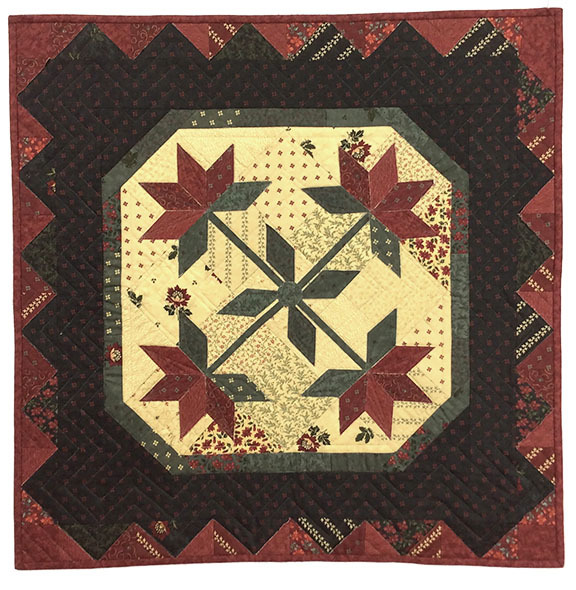 I'm adapting several new blocks using the diamonds, including the traditional pieced Hunter's Star block (see next week's blog for Prairie Christmas quilts). For Oak Haven and fall, warm argyle sweaters fit the theme. A KT Oak Haven Jelly Roll plus 2 fabrics make this scrappy, strippy lap quilt suitable for snuggling in any weather. Large diamonds are cut from the JR strips using the 2 1/2" diamond template, then layered with 2 tan small diamonds; topstitch. 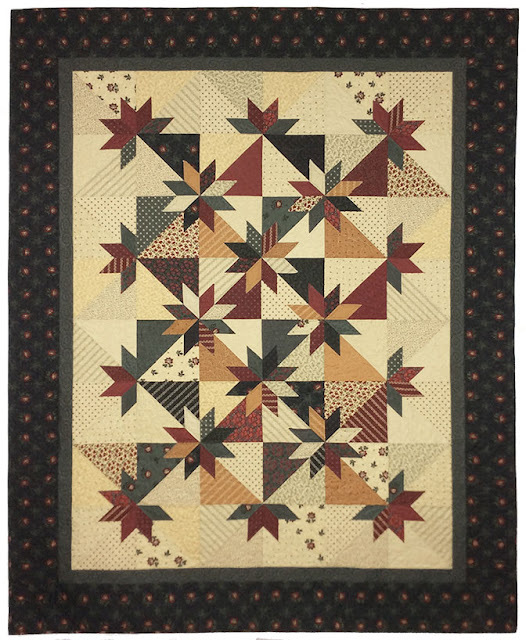 The layered diamonds are lined up on the seam line of the two coordinating fabrics for easy placement. Topstitch them in place and you're done! 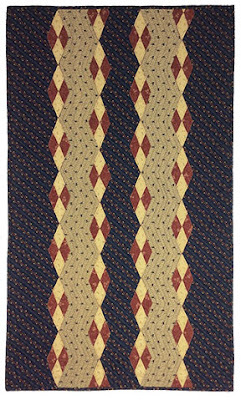 Choose the color scheme of your choice for a quick strippy runner made with 4 coordinating prints. I made mine red/tan/navy to use this summer. I couldn't wait for fall! 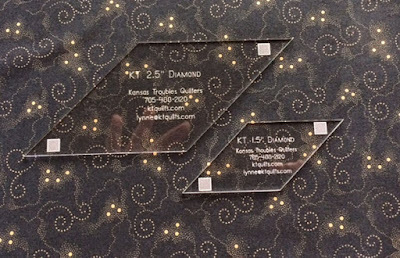 Comment this week to win a set of the KT Diamond Templates. 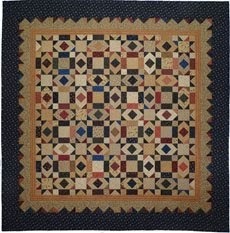 I'll show more quilts using them in the coming weeks. 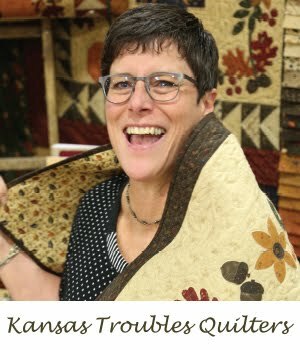 Kathy H -I love this quilt. Your acorns are so cute. It's so fun to find an acorn shaped sewing help. You're the winner of some KT Oak Haven fabric acorns. 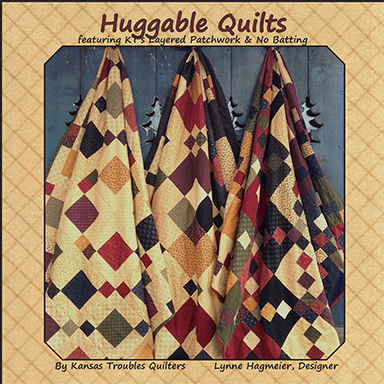 Email us with your shipping address at lynne@ktquilts.com and I'll send them out right after I return from market. Moda's All-Stars Scraps Made Simple is the newest book published by Martingale organized by Moda's very own Lissa Alexander. We're all excited for the unveiling at market this week. 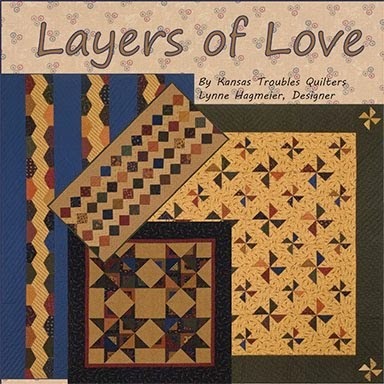 There are more than a dozen unique quilts offered to help use up your scraps by such acclaimed designers as Lissa Alexander, Lisa Bongean, Sherri McConnell, Amy Ellis, Laura Boehnke, Carrie Nelson, Jenny Doan and more. I'm honored to be included in this talented group of women. Here's a preview of the book and my quilt, Cutting Corners. 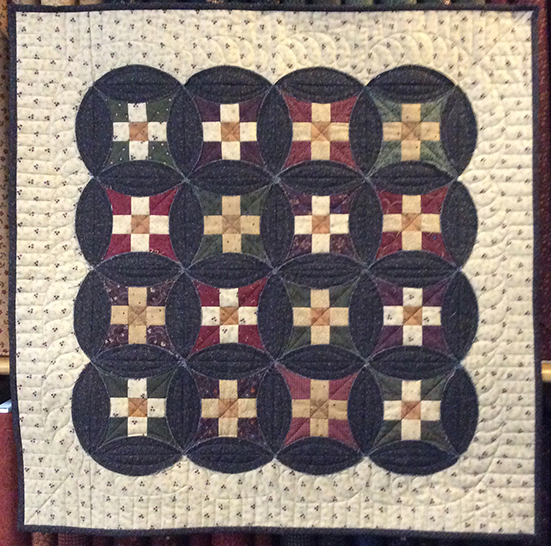 I'll share with you how to make perfect points on the churn dash blocks using my layered patchwork method. 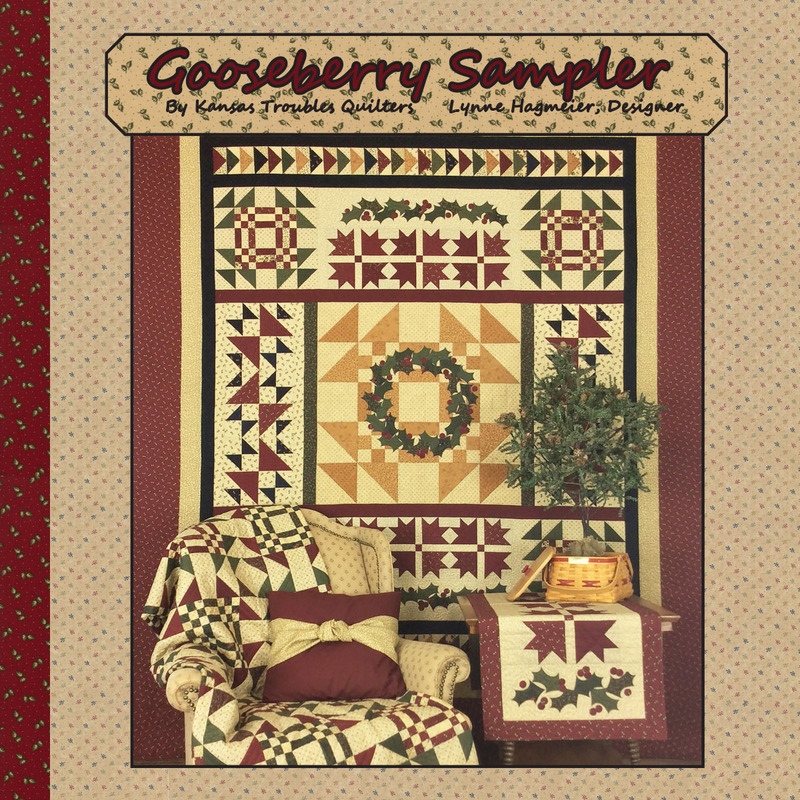 Comment below to win a Scraps Made Simple book of your own and start busting your stash today! I always breathe a little easier once we're at market, unload the car and set up the booth. Did I remember to throw in a little basket/box for business cards? Did I bring just one more piece of fabric to cover up whatever? Do we have enough brochures? Geez, I've only done this about 40 times in my life (seriously). When will I have it down to a science? Probably never since it changes from year to year. For tonight, I'll check the suitcase one more time to make sure we have all the Oak Haven quilts, pop open a Black Cherry Mike's Hard Lemonade, and chill watching the latest episode of Gray's Anatomy. Maybe. As promised, here are the accompanying projects for the Oak Haven lap quilt from last week - the 2 runners and pillow sleeve. I love the lap quilt and couldn't wait to finish it to get to these smaller projects with the same feel of autumn in much less time. 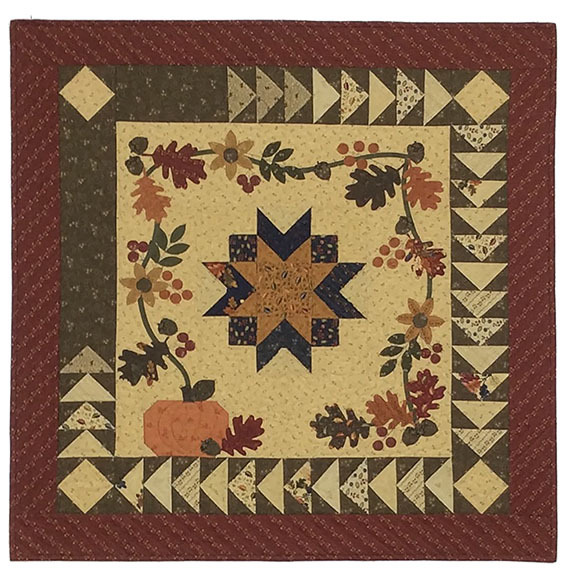 The combination of flying geese using our layered patchwork technique paired with fused raw edge applique equals simple fall decor in an afternoon. 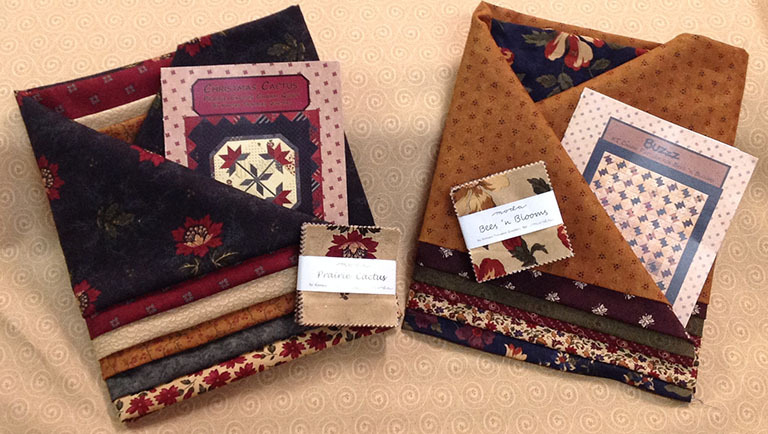 Choose to make any of these Oak Haven projects with just a charm pack plus a couple fabrics. All the prints in the Oak Haven collection in a nice little bundle. 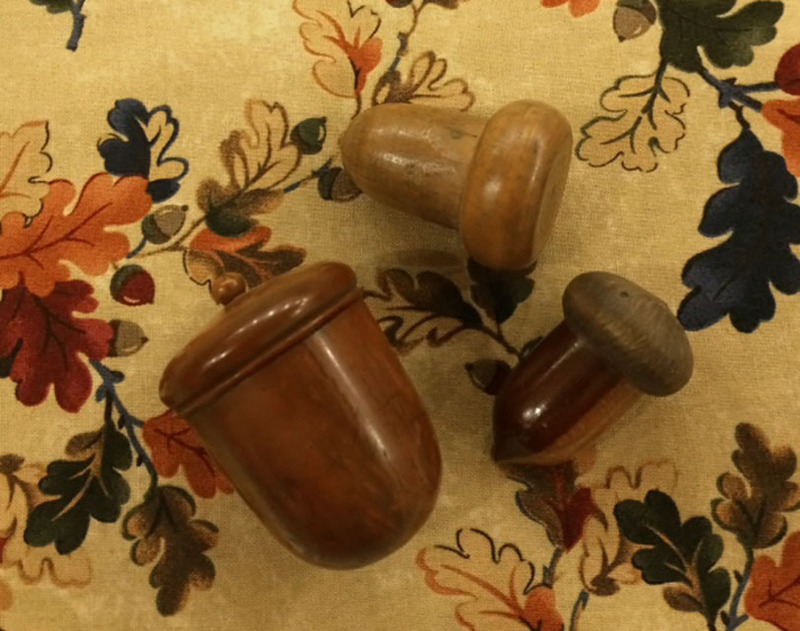 A few more sewing needfuls from my acorn collection. Next week, I'll share the final projects from the Oak Haven booklet featuring our new KT Diamond templates. 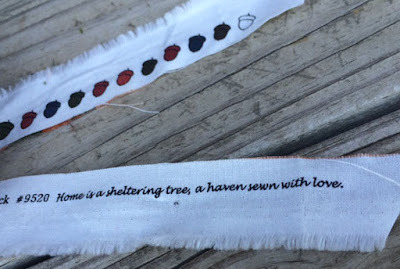 Comment here to win an Oak Haven Charm Pack to start on any one of the above projects. Yes, two giveaways this week to celebrate market! 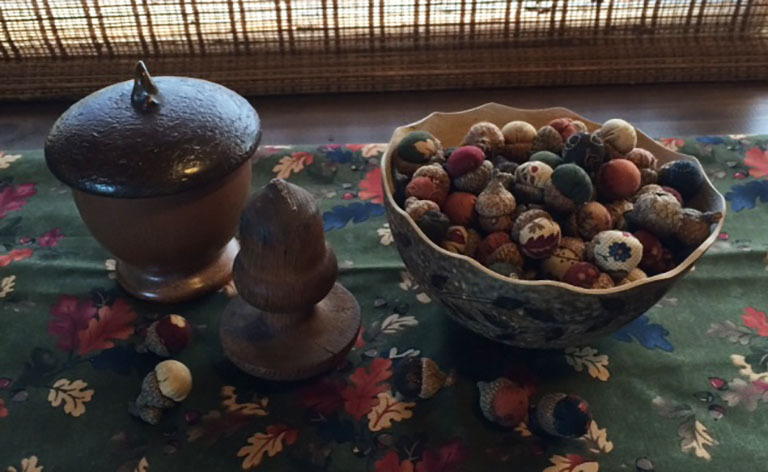 I have a special "thing" for acorns. Don't know where that comes from? Probably the same place where my love affair with lace, vintage hankies, salt cellars, quilts, fabric and.......you get the idea! A little jacked up! :) What a nice giveaway. Congratulations, fellow acorn addict! 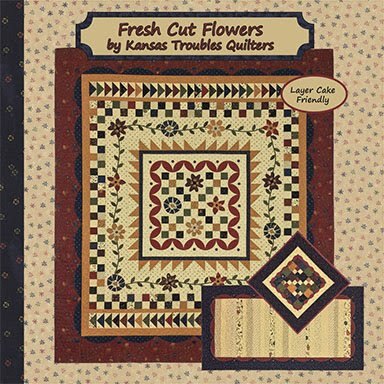 Send your shipping address to lynne@ktquilts.com and we'll send out your KT Collector's Club pack. Enjoy! I admit it. I'm obsessed with acorns. I love autumn and everything that comes with it - cool nights, snuggly sweaters, leaves turning fiery colors crunching under foot, and especially, acorns large and small. 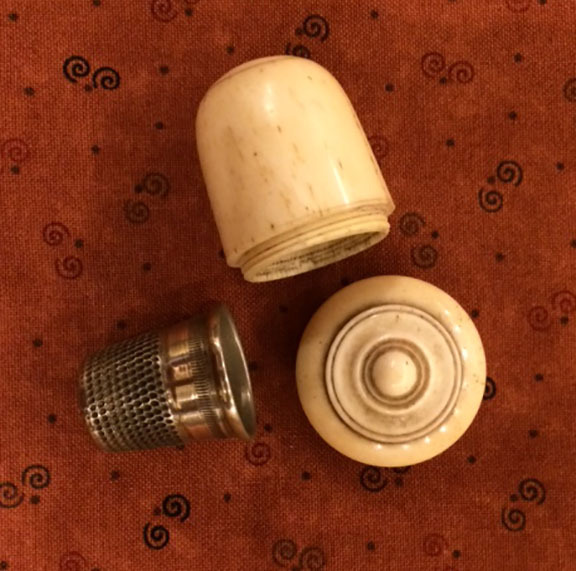 I'm enamored with their shape, perfect for holding a thimble. I think the acorn caps are adorable and have jars of them. OK, maybe I don't need a 12-step program for my particular addiction (some people's husbands would disagree), but there are times when it seems just a tad out of control. Even I was surprised (a little) when I started searching for all the sewing related acorn items I've collected over the years. 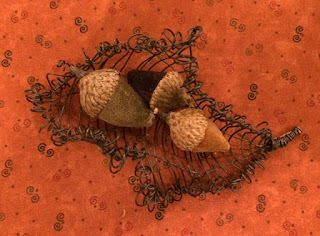 Someday I'll share all the non-sewing acorn stuff and jewelry inspired by the little nut. and even little acorns handmade with KT Oak Haven fabric! Thanks so much to Ginger at TheGingerSnapShoppe.Etsy.Com who created them for me. 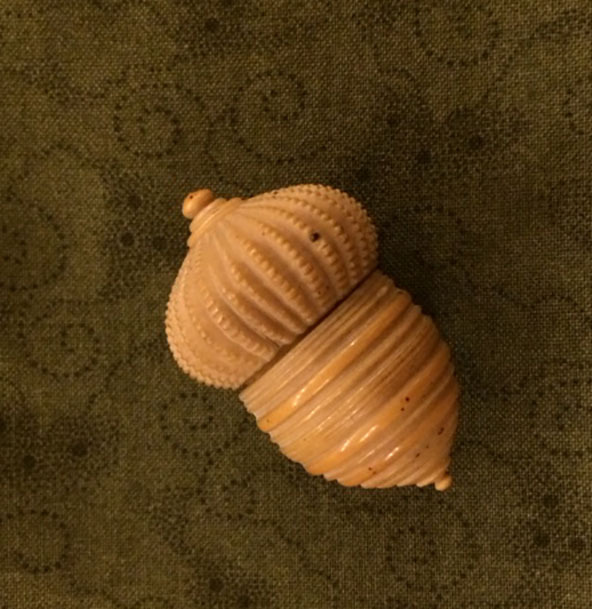 Check out her etsy site for all kinds of adorable acorns and much more! 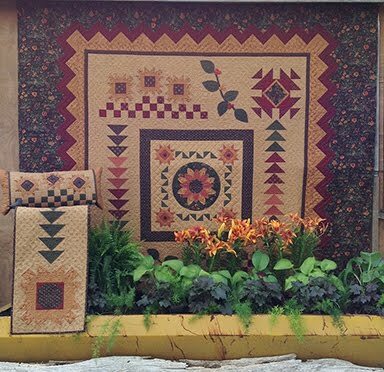 Heading to Salt Lake City, UT for Quilt Market? Stop by my booth in the Moda Designer section and pick out your favorite acorn! Right now, the cutest acorn ever is on my newest fabric collection, Oak Haven. Moda encourages us to submit a quote for the selvedge of our fabric and uses one of the main motifs from the prints as the color dots. 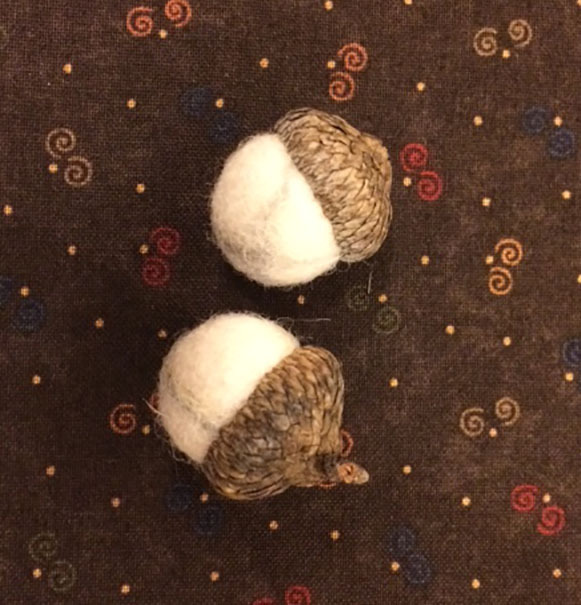 Mine is acorns! So fun and unique! Just what you'd expect from Moda. Selvedge edge on the new Oak Haven fabric collection. 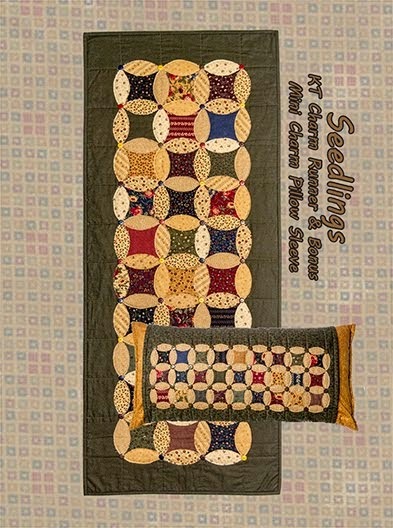 Wouldn't these selvedges be the perfect addition to your next project - quilt labels, strips in blocks, bags, pincushions, etc. 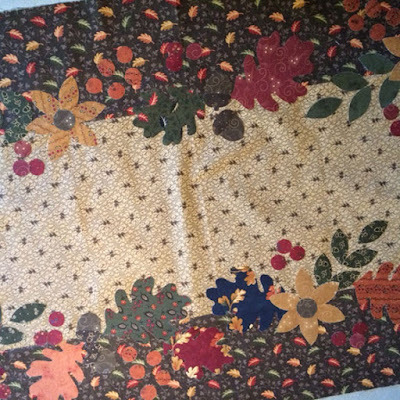 So what does an acorn obsessed quilter do when creating a fall quilt? Piece a few favorite blocks using my layered patchwork technique for quick results, and scatter acorns and oak leaves and flowers and berries all over! Oak Haven lap quilt 66" x 72". Layer Cake friendly. 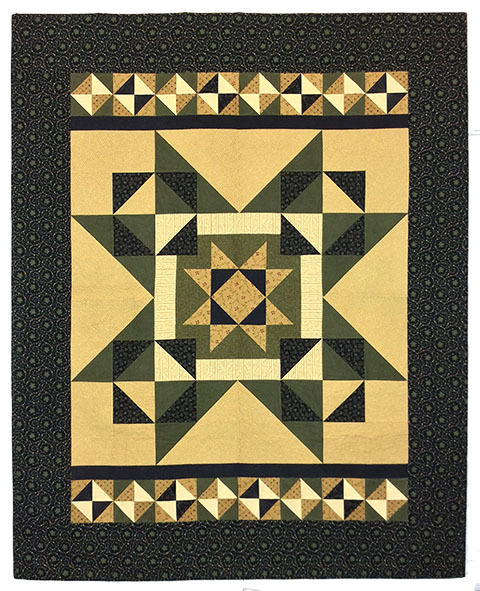 My heart flutters every time I look at this quilt. It's one of my all time favs. Next week I'll share the runner and pillow sleeve that were inspired by leftover parts & pieces that coordinate perfectly. I have my fall decor all ready to go. How about you? Comment here to win a handful of my custom KT acorns. Debra McClanahan - That's the thing about a cruise-you have a set aside time to sew. I've had too many distraction so far this year (our daughter's wedding is 3 weeks from today)and I miss the actual sewing part of quilting. Watching beautiful fabric become part of something new is a big part of the experience for me. Would love to win your tans and put them into a new creation. 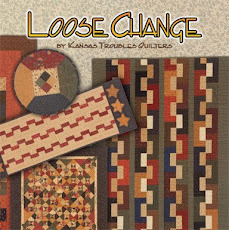 Please email your shipping address to lynne@kquilts.com and Jamie will pack up your tan scraps and send them your way. Thanks to everyone who share their comments each week. I look forward to hearing from all of you. 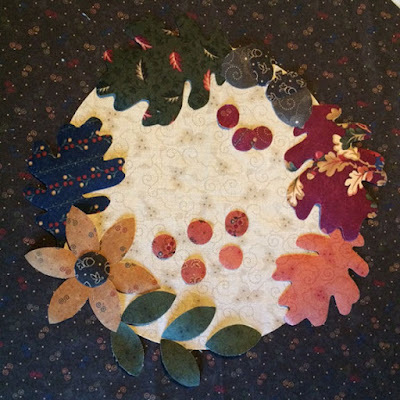 Please join me May 16th for a 6-part series of tutorials on my Layered Patchwork & Raw Edge Applique techniques. If you missed the premiere in January, you have another chance to see my unique methods up close. 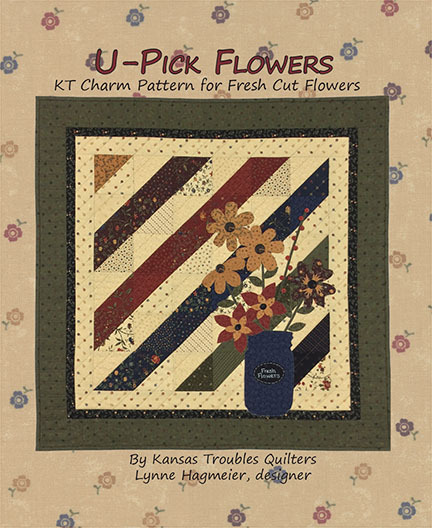 We'll be making 3 projects featuring KT precuts, rulers & templates - Mini Barn Raising, Clara's Window Garden, and Kansas Sunflower Runner. All 6 classes are only $35! Go to CraftU for more information and to sign up. Kits are available from KTQ. 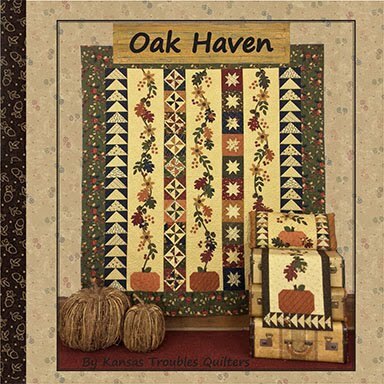 To all my quilting friends, please, let me introduce you to Oak Haven. It's my new favorite fabric collection! 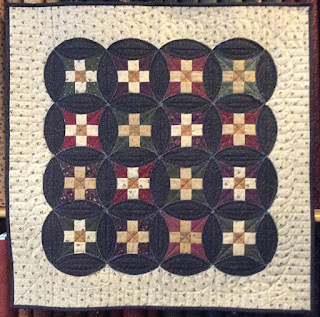 We're finishing up the last few projects before Spring Market in Salt Lake City in a couple weeks - quilting, binding, taking pictures and adding one more thing. I've been cutting out leaves, acorns, flowers and berries for weeks to stitch onto a lap quilt, runners and a pillow sleeve. I LOVE how everything is coming together. But something strange is going on. 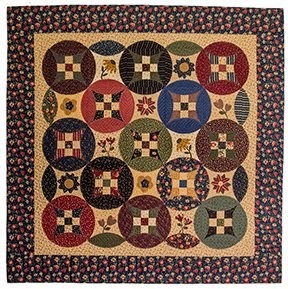 You know when you decide to make a scrappy quilt from your stash and dig out your basket of scraps - and even share with friends - but the basket is full again the next time you look? I swear, the same has been true for these appliques! Each night, I think I've used most of the pieces I've cut, adding a few more berries here and tucking in another acorn or two there. I go to bed satisfied that I'm almost done. But, in the morning, there are more leaves and acorns and berries and flowers scattered on my cutting table. They just keep multiplying! 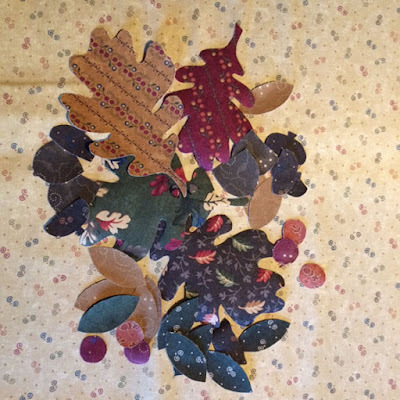 Oak leaves, acorns, flower petals & berries for Oak Haven projects. So of course, I make one more thing to use them up. Robert says it's all about the pre-Market frenzy of making lists, gathering props for the booth and "just one more thing". Until we get in the car to head to Utah, I have a hard time sitting back and saying "That's enough, I'm done". 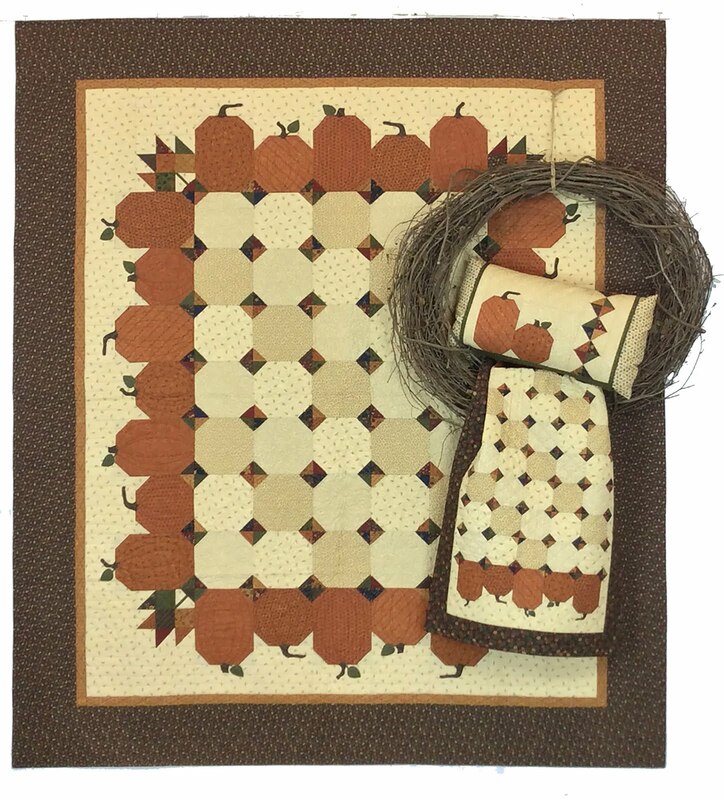 Harvest Runner with a charm pack and 2 fabrics. I know all of you can relate. When was the last time you went on a shop hop with friends, had a fabulous time, and announced in the car on the ride home, "That's enough, I'm not buying anymore fabric for months!" Uh huh. You totally understand me. 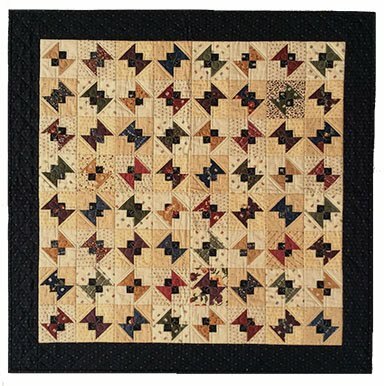 Part of being a quilter is our creative souls need to be fed, nourished by fabric and thread and books and "just one more thing". It's what keeps us looking forward to the next market/shop hop/fabric collection/quilt. 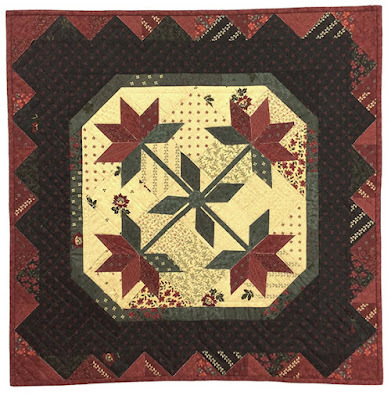 So hang around for the next few weeks and see all the new projects for Oak Haven - plus the new Prairie Christmas arriving next month! So much to see. So much to share. Are you a KT Fan? Can't wait for the next fabric line to hit your local quilt shop? We'd love to give you a head start with our KT Collector's Club pack. 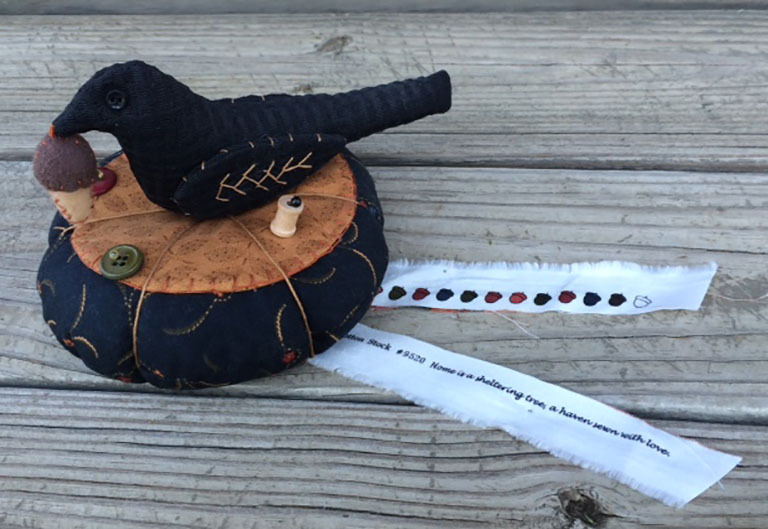 Three times a year -when a new KT fabric collections arrive - we will auto-ship (6) fat 1/4's, the charm pattern created especially for that collection and a mini charm for just $25 (postage paid in USA). That's a $30 value BEFORE shipping costs! We want to share a little bit of the newest fabric with each of you. So call Jamie or Robert at 785-488-2120 today. It's not too late to receive the Bees 'n Blooms pack, or sign up to begin your KT Collector's Club series with Prairie Cactus, coming up soon! 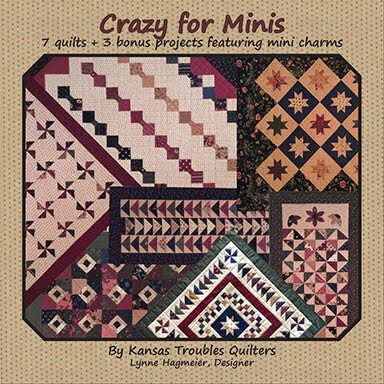 Comment here for a chance to win a KT Collector's Club pack for Oak Haven - 6 fat 1/4's, a mini charm pack and the charm pattern. You'll have to be patient since it won't be ready for a couple months. If you can't wait, call Jamie to get started today!